So I went and dug some figures recently. Numbers cited come from the World Bank, and official chavista institutions. Hugo Chavez is a peculiar dictator. A dictator, nonetheless, that has not had the need to kill, or disappear, thousands of foes. He just buys them off. When that fails, he kills its foes' public personas, or gets his courts to accuse and imprison them on trumped charges. No one can touch him. No fortune in Venezuela is large enough to compete, to counter him. 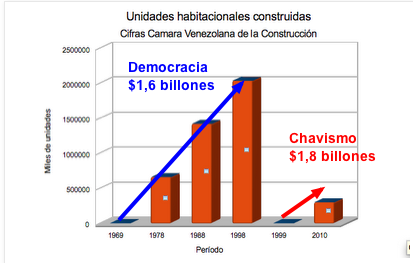 Since his arrival in Venezuela's presidency in 1999, Chavez has enjoyed a GDP of $2 trillion. Give or take. Hugo Chavez is, the $2 trillion dictator. Hugo Chavez has enjoyed an income larger than what the previous 8 administrations got COMBINED, between 1958 and 1998.
built, by Chavez and predecessors. Then one has to hear nonsense, such as "the opposition is atomised, keeps shooting itself in the foot, is disconnected, didn't serve the poor, is elitist, oligarchic..." Right. Above all else, elitist and oligarchic, when compared with the $2 trillion dictator. Pariahs, such as CEPR's Mark Weisbrot, argue that poverty has been dramatically reduced, from 54% to 30%. No one, of course, buys into Weisbrot's propaganda, for even the cat knows that Chavez's figures, which are the fountain of all of Weisbrot's arguments, are not trustworthy. Still, let's give his apologists the benefit of the doubt. Can anyone explain how come, after $2 trillion, there are still 30% of Venezuelans living in poverty? Venezuela, it must be borne in mind, is a country of 28 million people. While we are at it, on the recent issue of floods, can anyone explain how come the Chavez regime has only been able to build, since 1999 and with $2 trillion, 296,047 houses for the poor, while his predecessors built 2,033,481 houses, between 1969 and 1998, with a fraction of that income? To conclude, with less than a fifteenth of the amount Chavez has gotten, Europe was rebuilt after WWII. He is the most outrageous clown of a dictator since Idi Amin Dada, going on for four decades, supporting all flavors and colors of deadly terrorism. Europeans put up with him. Lybians obviously put up with him. Then there is the Assad family. Similar story, without that much clowning. Maybe there's a problem with the whole idea of the State controlling oil, which usually means that the "President" controls oil. I apologize for this link i will send, seeing as I am not currently on twitter and had no other way of contacting you, I will simply leave a comment for the time being. I have came across your writing and found it worth my time, I share many of the views, and so I found this particular piece (hyper-linked) quite amusing. wondering what your thoughts are on this?? Just came across your own link a few years back, that explains my confusion as I was reading venezuelanalysis.com and thought "has the world gone mad!?" I'm glad you explained that on a former post. "Gregory Wilpert of Venezuelanalysis married to Chavez's official"
Stefanie, Gregory Wilpert is as credible as a paid propagandist can be. His 'explanations' are beyond irrelevant.